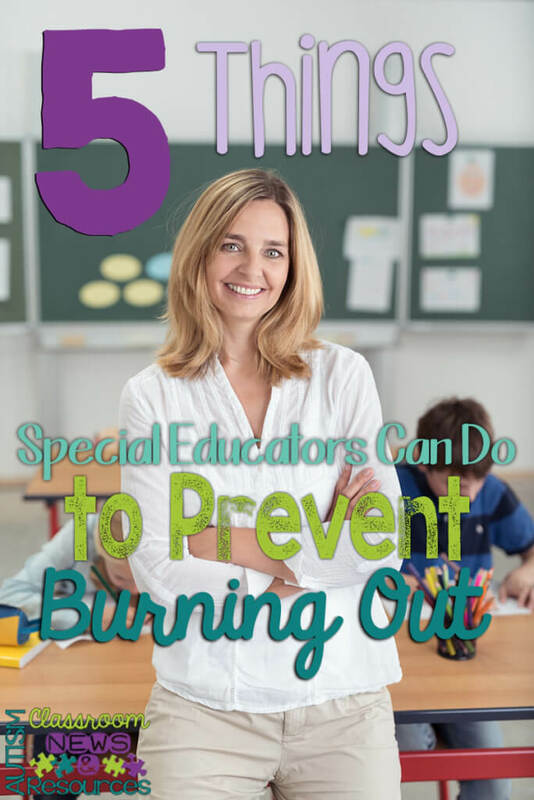 Everyone working in the field of special education is susceptible to burning out at this time of the year especially. 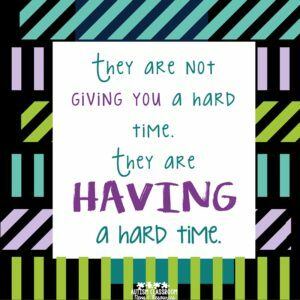 Whether you are a teacher, a speech pathologist, an OT, a paraprofessional, a behavior specialist, a counselor, a psychologist or administrator, or any other person working in a school setting, this time of year is crunch time. It’s decision time and IEP time. It’s end of the year craziness and testing. It’s changes in routines in the school day that lead to meltdowns and “come-aparts” (as my southern friends call them–doesn’t that sound better than meltdowns?). Everything at this time of year feels like it is happening so fast and yet it feels like the year will not end! And it’s the time of year that you begin to wonder why you do this. Or why this is so hard. Or is it worth it? So what do you do to make it through? Reducing stress is one way of preventing burn out but it’s a whole lot easier said than done. People always think that the way to reduce stress is to avoid it. However, avoiding it in most situations is simply not possible. I remember when I was at the doctor’s office in my first job after completing 5 years of doctoral work and a year of heavy-duty internship. I had just started a job that was essentially 9-5, which was completely a foreign concept to me. The doctor suggested that to lower stress I might need to change jobs to something less stressful. I remember telling her, “This is the least stressful job I’ve ever had!” After internship, the 9 to 5 job was a dream job and I loved it….the idea that it was the root of the stress didn’t make sense to me and the thought of leaving it was ridiculous in my mind. Reducing stress is much more about how we manage it, think about events in our lives, our perceptions about things and our interpretation of others’ actions and expectations towards us. And of course it has a lot to do with our own expectations of ourselves. Preventing burnout means changing the way you think about and perceive situations so we become resilient to the stressors that are inevitable in our life. So here are some dos and don’ts –some are easy and some are hard and longer term. And of course I’ll say at the outset that there are many more strategies out there besides these and I’d love to hear them in the comments. Time for yourself might be time with a loved one, time with your family or just time with yourself. I’m pretty introverted so after a lot of time interacting with people, I need time to be by myself. My family knows that there are times I’ll kind of recede into a room by myself and I need the alone time. Alone time refreshes me in one way. However, time spent with good friends or family members can also recharge your batteries. Figure out what balance works for you and then schedule that time into your planning. Not taking time for yourself leads to you getting more frustrated with the students and your family. Your brain needs down time to process problems. You will make better decisions with this time. In the long run, your health and well-being and that of your family is more important than a job. Maybe you run, maybe you workout, maybe you take a long bath, maybe you just turn on the music and dance in the kitchen. Everyone needs a way to bleed off the stress and bring back the happy. Movement has been found to be a strong protective factor against stress. For me, music has a huge impact on my mood. I have playlists on my phone for when I need a pick me up, when I need to rant, when I need encouragement, and even one called “despair” that was a playlist I played when I was just overcome by the world. However when I get upset or get stressed, I forget to do this. Whenever I just turn on the music and dance, it helps to put things in perspective and I wonder how I forget that. So find whatever it is that does that for you. When you have had a rough day, or just for the fun of it, don’t forget to let it go. Think about your internal dialogue. Does it consist of a continual list of things to do? Is it full of things you wish had gotten done or things you wish you had done? Or does it focus on the things that went well today and the things you got done? Does it focus on positive things that happened today? Optimism is one of the things highly related to resilience. Having a positive outlook isn’t always easy. So, make a point of listing all the things that went well today. Include the things you are good at, things that were positive, little gains that a student made, a positive interaction with a parent. Don’t discount the positive things that you might take for granted. Let’s say Parent A is always positive with you but Parent B rarely says anything but something negative. Don’t let the negativity of Parent B discount the fact that Parent A is telling you that you are doing a great job. Whether at the end of the day, teh beginning of the day, or while you are driving home, make a list of the positives. Record them on your phone or write them in a list and go back to them when you are frustrated. I’m not going to be unrealistic…in special education not taking work home at least part of the time is rarely an option. However, you do want to maximize your time at school to work so it doesn’t spill over as much. Saying no is important when asked to do things that you don’t need to be the one to do. However, I’m talking about setting limits on the time spent listening to the gossip from the school, getting caught up in the drama and other things you need to be able to walk away from in order to make your time at school productive. Erin Cobb gave some great advice in a talk she did once about this. She suggested having a colleague who you have an agreement with. When that colleague sees the school gossip or drama queen in your room or catching you after a meeting, she steps in and says, “Hey, you were going to show me how to do that thing” or something similar. There doesn’t have to be a thing…there just needs to be something to help remove yourself from the situation. The drama not only takes up your time, but it can sap your energy and motivation for the job. When something negative happens, reframe how you think about it. This is one of the DOs that isn’t easy to do and will take some practice. However, part of what blows up our days are what we let blow them up. Frame your thoughts about something that happened during the day from a positive perspective. For instance, Jeremy had a come apart today. He knows how to push your buttons and do just the thing that makes you feel completely out of control of the classroom. You found yourself getting very upset with him and then getting upset with the other staff because you had all decided you were not going to attend to the behavior and they are all talking about it. You know what, getting upset about the situation is not helping you. It’s actually making you more stressed out. Let’s reframe the situation. Jeremy had a come-apart today. A functional behavior assessment has shown that his behavior is related to gaining attention from the adults in the classroom and getting a big reaction. You are staying calm but you are seeing other staff in the room talking about the behavior. Instead of getting angry about it, focus on it as a training opportunity. Ignoring challenging behavior is difficult for everyone. Rather than feeling like the staff isn’t following the plan, focus on how you can help them to be more successful. Think about what other training is needed or walk over and hand them a note that reminds them to not talk about the behavior. Or shift their focus to something else in the room to tone down their attention to the behavior. By not getting upset about the behavior, you are following the plan (positive 1), you are setting a good model for the staff (positive 2), and you are not losing energy feeling out of control (positive 3). So not only have you kept your focus on the problem being solvable, you have created 3 positive things you need to remember at the days’ end–because they may not seem like big accomplishments, but they certainly are. 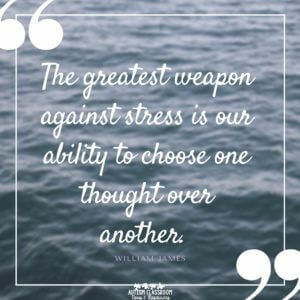 For more ideas about how to do this, check out this great article from Huffington Post on teachers using mindfulness to help reduce stress in the classroom. I started to write this as a do/don’t list but it got incredibly long. So I followed this post up with 5 more things you can do (or not do) to prevent burnout. In addition, join our community for more support. Join our SpecialEducatorsConnection Facebook group. Come join the Special Educator Academy..it's an opportunity to participate in a community of educators just like yourself. And there is training and tools along the way to help you feel more confident in your job. Do you have any resources on teaching others to ignore behaviors? When I worked at a camp for individuals with disabilities we were trained in “behavior culture” where we learned why constantly talking about aggressive behaviors was actually detrimental to the people we were serving. I just haven’t quite figured out how to reframe that training to share with my paras and the other teacher in my school.